If you're interested in remodeling your kitchen, living room, bedroom or practically any other room in your home, you would be doing yourself a favor if you looked into learning how to install recessed lighting. Recessed lighting adds instant depth and dimension to your room by removing the need for space-eating lamps, and they can also be used to highlight works of art or other collectibles. Check to see whether or not the ceiling where the fixtures are going to be installed is insulated or not. This is important because not all recessed lights are made for use in insulated ceilings. If you have insulation in your ceiling, purchase either IC-rated recessed light fixtures (this type can be installed in insulated ceilings), or non-IC-rated fixtures, and when installing them, make sure that there is no insulation near the fixture for a minimum of at least three inches along all sides of the fixture to allow for heat dissipation. There is also "new work" and "old work" recessed light fixtures. New work fixtures are chosen when there is no drywall on the ceiling and the fixtures can be secured directly to the ceiling joists. Old work fixtures are for installing in a finished ceiling and they feature lock-down clamps that keep them in place. Of course, you can still install new work fixtures in a finished ceiling if you have access above the ceiling where you can secure them to the joists. Installing recessed lighting is easiest if you have either a drop-in ceiling or access from the attic above, but even if you don't have one of these types of ceilings, you can still install them without much of a problem. One of the advantages of recessed lights is that they provide plenty of light inconspicuously, while looking great doing it. Because they can often be a focal point on your ceiling, ensure that they are evenly spaced and properly positioned. Take a measurement of your room and determine where you want your light fixtures to be positioned. Space them out evenly so the results look uniform. Use a stud finder to make sure each light fixture is avoiding a ceiling joist. Discovering a joist too late too late can throw your entire installation off. 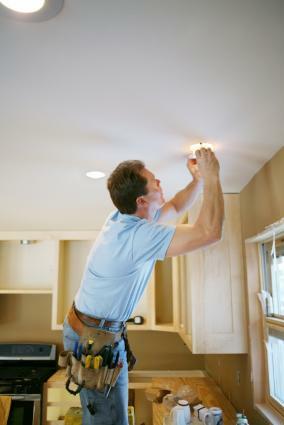 You may have to make slight adjustments to ensure that every recessed light is located between ceiling joists. Recessed lights come with templates you can use to make accurately-sized access holes. Hold the template up against the ceiling and trace it with a pencil. Use a drywall saw to cut out the hole. Do this step at every point where you're installing a recessed light. Figure out which recessed light fixture is going to be the first one in the series, where the power will initially be coming from the switch (for this article, the feed line from the switch will already be available). Run a length of 12-2 NM cable (non-metallic sheathed cable, also called Romex) from the initial access hole to the next in the series. Keep between eight and twelve inches of NM cable hanging out of the ceiling at both ends. Run another length of NM cable from the second access to the third, another from the third to the fourth and so on. Strip away about six inches of outer sheathing from the NM cable (on each end of cable) so the individual wires are exposed. Use wire strippers to remove about 3/4-inch of insulation from the end of each individual wire. Start your wiring and installing at the last recessed light in your series. Open up the wiring junction box on the fixture and pull the wire into the box. Depending on the type of fixture, you may need to remove a knock-out and use a Romex connector on the wire to secure it to the box, while others may have a plastic compression fitting already in place which will hold the wire without any extra connectors. Twist the black wire from the feed wire with the black fixture wire and secure them with a wire connector. Do the same thing with the two white wires. If the fixture has a ground wire, connect the ground wire from the feed line in the same manner. Otherwise, secure it to the green grounding screw on the inside of the box. Replace the junction box cover and push the recessed light up into the access hole until the rim is flat against the ceiling. Around the interior of the light fixture, there are clamps that slide up and click into place; use your screwdriver to slide the clamps up until you feel them snap in. Once they are all locked down, the fixture will be secured. Follow this same procedure for the remaining recessed light fixtures with the exception of the one where the main power line will be included. Keep in mind that for each of these, you will be connecting three black wires together, three white wires together and three ground wires together. If you're picking up a feed from a light switch, make sure the circuit is off at the electrical panel. Use a voltage tester to make sure it is off. Open up the junction box on the final light and connect the black wire from the feed circuit to the black fixture wire and the black wire from the cable leading to the next fixture. Secure the connection with a wire connector. Do the same thing for the white wires and again for the ground wires. Reassemble the junction box and install the light into the ceiling as previously instructed. Some recessed lights come with pre-existing rims that cover the ragged edges of the access holes, but not all do. If yours do not, purchase decorative trims that hide the jagged edges of the holes for a more professional and clean looking job. Install the properly-rated light bulbs (as indicated on the fixture's labeling), turn the power back on to the circuit and turn on your new recessed lights.